A few weeks ago Fallout 4 was released, and like all future games of the year, productivity has fallen through the floor, cosplayers are busy crafting outfits, and modders are busy tearing the game to pieces. As with all big game releases, Fallout 4 has a super-deluxe, ultra-collectible edition, and this version comes with its own Pip Boy, the in-game wrist-mounted user interface that manages stats, inventory, and quests. With a simple swipe of nmap, [Kyle] discovered two ports open on his PS4. By creating a relay to listen in on whatever is passing through these ports, [Kyle] built a tool that allows anyone to dump data from the in-game Pip Boy to any other service. The library and command line tool work with PS4 and PC and are able to dump stats and data from the in-game Pip Boy to the outside world. It will be interesting to see what kind of mashups could be created with this; especially interesting would be a leaderboard for an entire office of vault dwellers, but a TV-sized Pip Boy would also suffice. 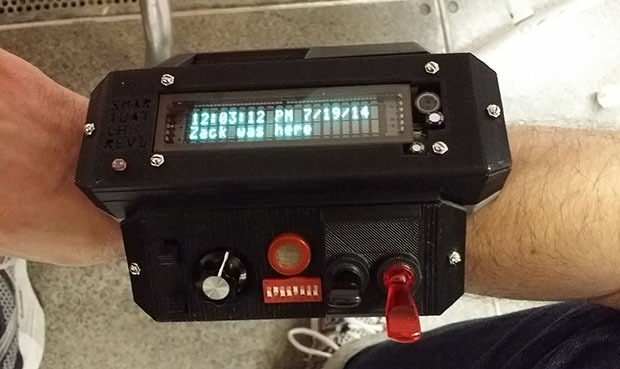 [Daniel] wrote in to tell us about his PIP-Boy 2000 prototype. While most PIP-Boy remakes we’ve seen tend to be focusing more on the aesthetic side, like a prop, [Daniel] is attempting to make a functional one. He has included a GPS sensor, RFID reader, and radiation detector in his build but did choose to stick with the familiar PIP-Boy visual theme in the menus. He has a very long way to go if he wants it to do everything the PIP-Boy from Fallout did, but his list of semi-functional features is growing steadily.